With the end of Daylight Savings Time on Sunday, gone are the evening daylight hours, and the leisurely post-work evening workouts they allow. Below are a number of clever options for bolstering both motivation and fitness levels during the shorter days. Also note that all suggestions here rely on groups; that's right: strength in numbers. For five years, Max King's Tuesday Performance Group has provided participants with short but focused and intense workouts led by one of the country's best trail runners. (Check footzonebend.com for a complete listing of weekly events). King, a Montrail-sponsored athlete whose long list of accomplishments includes winning a number of national and international trail running championship races, says that despite the high-intensity of the evening runs, the workouts are designed to accommodate all—from 5 to 11-minute milers. "We get all types of people, which is what's great about it," King says. He's able to achieve such inclusiveness by staging the interval-based sessions on predetermined loops, making sure everyone lands at the same starting and ending spot to mingle and engage before and after each effort. King outlines the most notable benefits of interval training—namely, cardiovascular improvements and increased metabolism. "You're definitely going to get more out of trying to do something a little more intense than going out the door and trying to slog through the miles," King notes. "Plus, it's nice to have someone to run with—especially in the winter." Details, details: Keep up to date with workout times and locations by emailing max@footzonebend.com. Next week's Tuesday workout starts at 5:30 pm in Farewell Bend Park (which has some streetlights). After a warm-up, the evening run will be explained and get underway at 5:50 pm. Free. If it's too wet, cold or dark to get on real rock, head indoors. Owner Jim Stone reports that the Bend Rock Gym is currently adding an additional 13,000 square feet to the already expansive 7,000-square-foot space, with 60 to 70 percent of the new space dedicated to roped climbing. 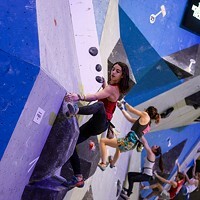 With ceilings nearly 20 feet higher than the current set-up, the routes—which will top out at 47 feet—should challenge even the most Popeye-armed climbers. The new routes are primarily intended for intermediate climbers who dabble in the 5.9 to 5.11 range, but there will be both easier and harder options. Other improvements include a party room (with kitchen) for events and kids, a beginner friendly wall, a weight room with treadmills, an exercise space for yoga and dance classes and a locker room with showers. Stone says the improvements should be wrapped up before the year's end. The multi-million dollar project, however, will come with a modest price increase for users. Adult day passes will bump from $15 to $16 ($12 for youth 15 and under) and monthly adult passes will be $69 (or $59 for those who opt for direct deposit). An annual pass will still be less than $600, and Stone expects to continue Thursday's reduced-rate day pass. Details, details: Bend Rock Gym, 1182 SE Centennial Ct. 541-388-6764. 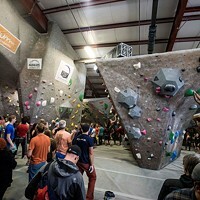 Stay tuned to bendrockgym.com and the BRG Facebook page for updates and upcoming events and competitions. The gym is open during construction, hours vary but the gym is open until 10 pm weeknights and until 8 pm on weekends. Juniper has long been one of Bend's best fitness facilities, and for good reason: patrons (and their kids) can swim, lift weights, do yoga, play tennis, or just lounge—all for a very affordable $6 a day or $7 if taking a class. It's even cheaper for students, seniors and youth. As the mercury continues to plummet, consider taking workouts indoors. Swimming is a great full body exercise and yoga classes at Juniper are quite good, despite their rock-bottom pricing. Details, details: Juniper Swim & Fitness Center, 800 NE 6th St. 541-389-7665. Updates, class schedules, and event information available at bendparksandrec.org and on Juniper's Facebook page. Open Monday-Friday 5:15 am-9 pm; Saturday 8-6 pm; Sunday 9-6 pm. The newest yoga studio in Bend is at the Mill Quarter. New, yes, but the names of the owners and instructors should be familiar. Aleta Adams, one of three co-owners (Rebecca Bell and Ulla Lundgren are the other two), says the non-dogmatic studio offers a variety of classes that range from strength based to stretching and mindfulness. The Yoga Lab website is simple, clean and easy to use. A weekly class schedule is always clearly posted, showing times, dates and a clear explanation of offered classes, and a click-through option to book a class in advance. There are a number of pricing packages—10 classes for $80, a 30-day unlimited pass for $80 and a one-class drop-in pass for $12— but one of the most attractive options is the deeply discounted lunch class. Monday through Friday from noon to 1 pm, community members can drop in for a one-hour lunch session for a mere $8. Details, details: The Yoga Lab, 550 SW Industrial Way, Suite 170. 541-633-7363. theyogalabbend.com and on Facebook. See the website for class times and descriptions. Anywhere from two to four classes are offered per day. Adams hopes to soon add an early morning class to the schedule.